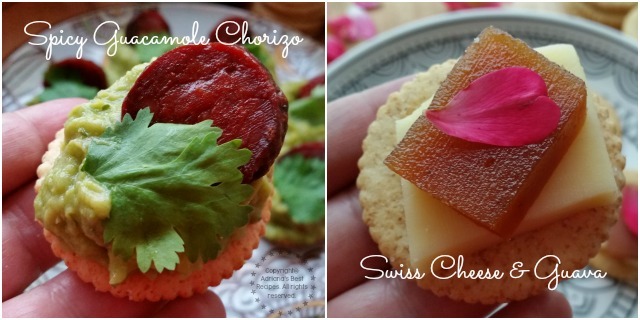 I like to create snack hacks with Latino flair using ingredients that I already have on hand in my pantry, my fridge and my edible garden. These snacks are perfect to enjoy for a midday treat or to offer as appetizers when entertaining at home. 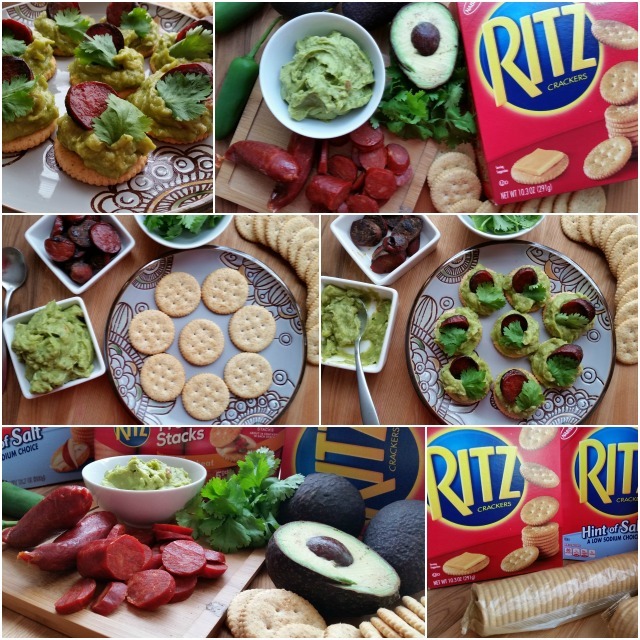 These easy recipe hacks are examples of what you can do at home and get inspired to explore the endless possibilities that RITZ® crackers offer while entering for a chance to win one of forty $100 Walmart e-Gift Cards (10 per week) by uploading an Instagram photo of your RITZ®-topped creation with #putitonaritzcontest. Purchase of RITZ® is not required. Click HERE to enter the Snackify Challenge with your own RITZ-topped creation for a chance to win a $100 Gift Card! Me being from Mexico I love the combination of guacamole with chorizo, this snack hack is great to enjoy before a meal or for serving during the cocktail hour. Prep the guacamole mixing all the ingredients in the blender or food processor. Cut the chorizo in slices and fry until brown and set aside. Place the RITZ® crackers on a serving plate. Add the guacamole on each RITZ® cracker using a spoon, top with one slice of cooked chorizo and garnish with one cilantro leaf. 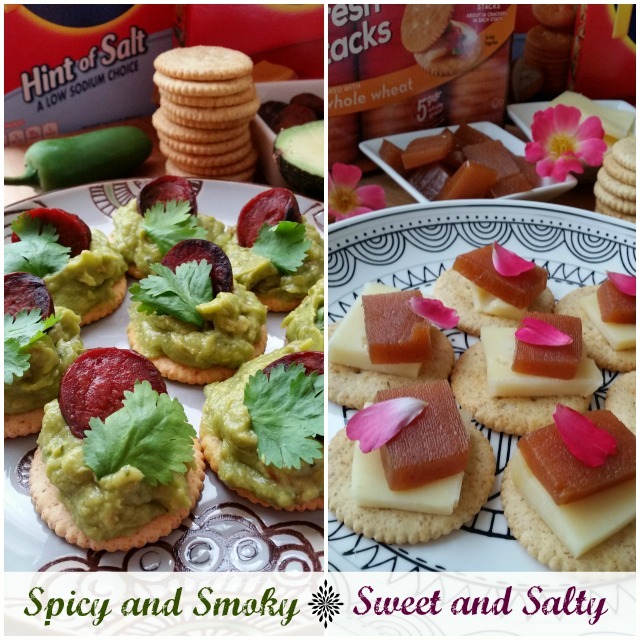 This bite is very well balanced since has the spiciness of the creamy guacamole, the smokiness of the Spanish chorizo and the crispiness of the RITZ® crackers original flavor or the RITZ® Hint of Salt. In Spain is very common to have cheese with fruit and spreads as a dessert. My grandfather was from Madrid and I was used to enjoy with him this treat at the end of our main meal when I was a child. Based on this memory I am bringing to life an old-time favorite to create a snack hack with guava paste and swiss cheese paired with RITZ® Whole Wheat crackers. Cut the swiss cheese in small pieces and do the same with the guava paste. 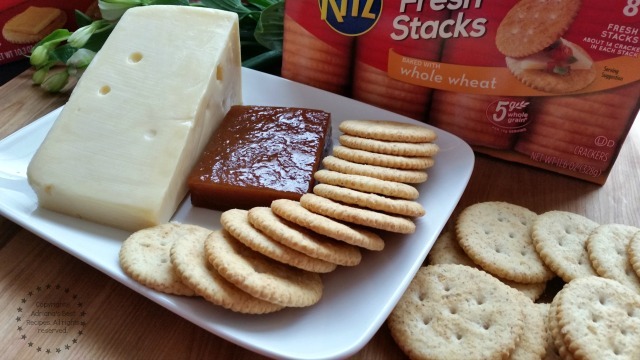 Place the RITZ® Whole Wheat crackers on a plate, top with the swiss cheese, and the guava paste. Finish with an edible rose petal to add a gourmet touch. This bite has the perfect balance between sweet and salty. The edible rose petals also add a very nice aroma to this delectable bite. 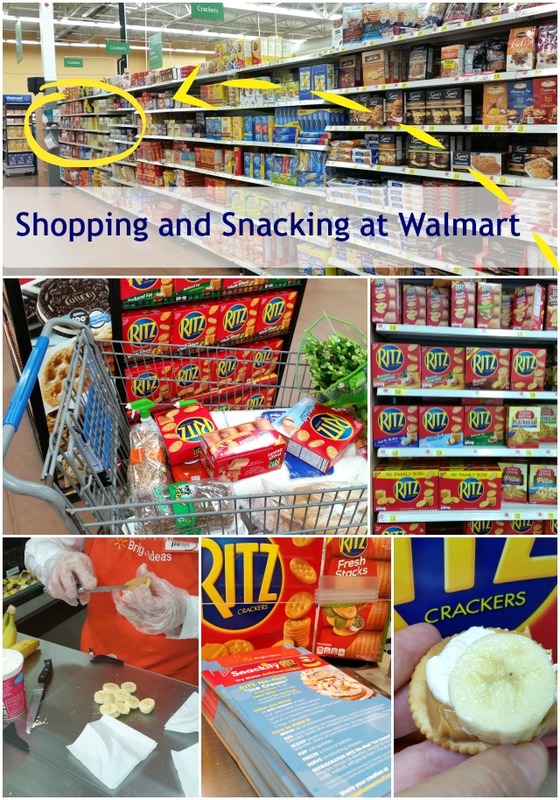 This past weekend while shopping at Walmart I had the chance to try some of the RITZ® Snackify Challenge recipes and my favorite was the banana, marshmallow cream, peanut butter on top of RITZ® crackers original flavor. At Walmart you can find all the RITZ® crackers that come in different flavors such as RITZ® Whole Wheat, RITZ® Roasted Vegetable, RITZ® Reduced Fat, RITZ® Hint of Salt, RITZ® Bacon, RITZ® Fresh Stacks WW, RITZ® Bits Cheese, RITZ® Bits Peanut Butter, RITZ® Garlic Butter, RITZ® Honey Wheat, and RITZ® Everything. 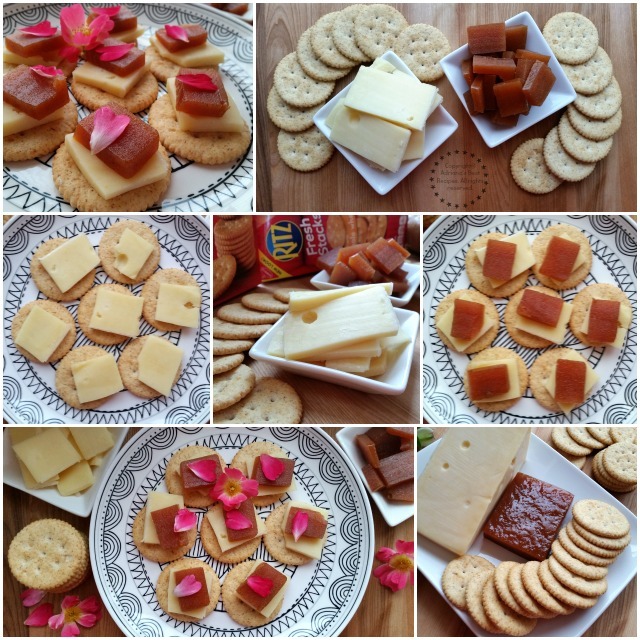 I invite you to try any of the RITZ® crackers flavors and let your creativity shine, you could be a winner by entering the RITZ® Snackify Challenge! Thanks so much for sharing your snack hacks and the chance to win this awesome giveaway. Many thanks Terri for stopping by good luck on the giveaway! These are all great ideas for an appetizer or snack! They look really good! Love the Latina twist you put on the Ritz crackers. I’ve never tried it with guacamole before…going to have to try that :). Gracias por compartir estas ideas con nosotros! Oh my goodness, that’s the way to dress up a Ritz. It looks phenomenal! Yum! Having Ritz is one of my favorite snacks. I’m obsessed with the cheese flavour Ritz. Put some cheese and a tomato on, yum! These are great too! Ritz has such a great variety of crackers to choose from and there are so many ways to dress them up. Your guacamole looks yummy! Ritz crackers are my families favorite snacks.. and thank you for all these nice ideas. mmmm Ritz are my favorite crackers! Las Ritz son irresistibles! Esa combinación está perfecta. Me encanta la combinación de dulce y salado. Muy buenas ideas para cuando nos llega visita. Me encantan las Ritz y si tienen avocado mucho mas! OMG the Spicy Guacamole Chorizo Snack looks so delicious I will try serving this during my next dinner party YUM! Me encantan los videos, me dan ganas de bailar. Y se me antojaron esas ritz con ate y queso, rico! Se mira super delicioso!!! Estas galleticas van bien con todo! Me encantan estas combinaciones. Can’t wait to try the swiss and guava ones! I enjoy your plates presentations!! 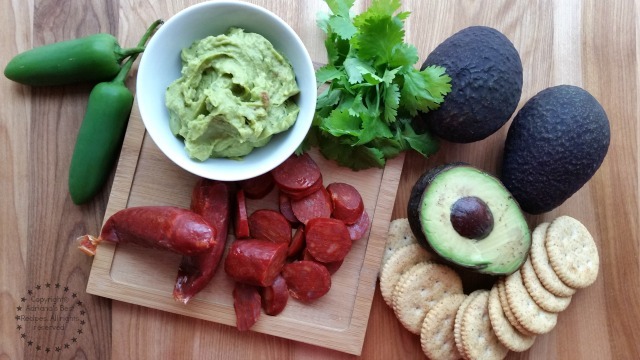 and the Guacamole and chorizo recipe just awesome! Que rico! We love snacking on Ritz! Many thanks for the kind comment, rose petals are very common in many food applications. The only requirement is that those roses need to be edible, this is need to be grown for human consumption not for ornate purposes. I grow edible flowers in my own garden and use them a lot for garnishing.